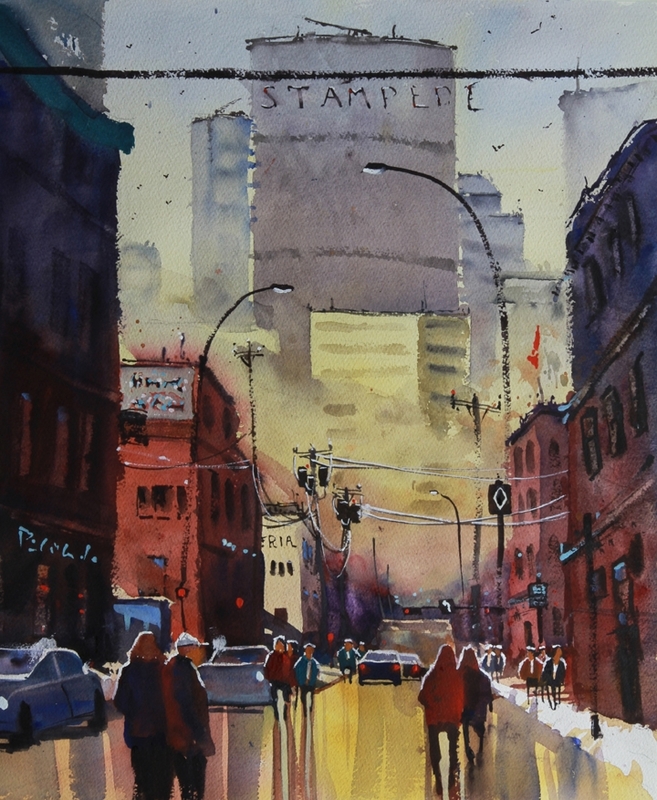 On Wednesday, Jan 22, I did a demonstration for the Calgary Community Painters Society. This is the first time I had met this group and they were delightful, very enthusiastic and interested. The type of audience that you enjoy painting for. This picture is a view from Inglewood, looking at the Bow Building. I think that the Bow Building like the Calgary Tower are icons of Calgary and this view from Inglewood shows the Bow to good advantage. The process I used for this painting is what I call the 3 wash method. The first wash is basically the sky colours spread over the entire painting except for a few highlights in the centre of interest. Wash #2 involves all the mid tones (nearly the entire painting) Wash #3 is the final details, highlights and little bits and pieces. I like to do paintings like this quickly, just capturing my impression of the scene so I try for large, clean washes. In order to keep the washes fresh I choose not to cut around too many shapes and instead add Chinese White or white gouache at the end to create highlights. I always include figures which I feel help to create a story. One member asked why they would be wandering all over the street in the middle of the traffic. The answer is that they wouldn’t be there (at least not for long). However, as well as adding that story element they also add a certain tension to the painting with helps make it entertaining. It was a very enjoyable evening. I finished the painting up at home and I estimate it took about 2-1/2 hours in total. This entry was posted in Art Blog and tagged calgary, urban landscape on January 24, 2014 by Rex Beanland.